How is the production of the video spots coming along? We are anxious to see your work. The spot must be submitted via the Video Submission Ecological Engine and the deadline is April 5th. 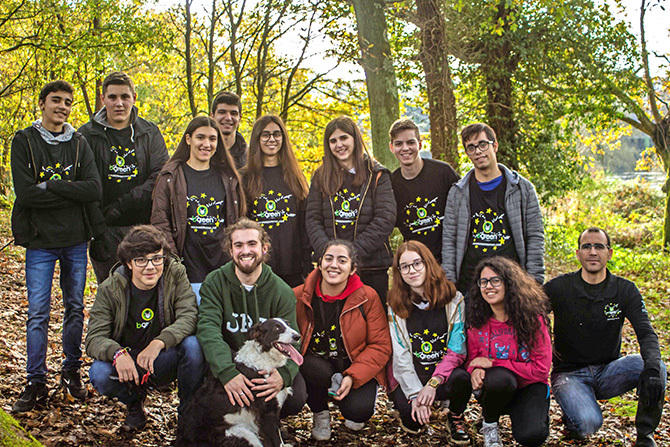 Meanwhile, for the past few months, the Greeners, a group of young volunteers from OFICINA – Professional School, carried out a set of initiatives within the scope of bgreen’s social and environmental project. For instance, two of the latest enterprises comprised the cleaning and maintenance of two rivers in the region of Vila Nova de Famalicão in Portugal. The first consisted in cleaning a 500 meter extension of River Pelhe, a tributary of the Ave River which is born in the parish of Portela, in Vila Nova de Famalicão, and disembogues in the parish of Lousado. With a 20 km extension, it is one of the most important affluents of the Ave River and has been abandoned and extremely polluted for many years. Nowadays, with the construction of Parque da Devesa and the cleaning and maintenance initiatives it presents us with crystal clear waters. The second initiative entailed the maintenance of a reforested area alongside the Ave River. This initiative had a set of objectives such as: weed and other infesting plant control close to the recently planted trees, garbage collection from the reforested soil, plantation of new trees replacing the ones that had not survived the fires and installation of artificial bird nests on major trees. The Greeners also participated in the preparation of a composting community center with an associated pedagogical and biological vegetable garden in Seide, a village in Vila Nova de Famalicão, where the great Portuguese writer Camilo Castelo Branco lived from 1863 until his demise in 1890. The work consisted in building compost units with wooden pallets, the preparation of a path to access the units and tags for all the plants cultivated in the vegetable garden. These initiatives were developed in close collaboration with YUPI, Associação Famalicão em Transição, Associação EDUPA, and the municipality of Vila Nova de Famalicão’s youth sector and have enabled our students to deepen their social and environmental commitment in accordance with Pope Francis challenge towards the defense of our Common Home stated in the Encyclical Letter Laudato Si’. Finally, we rejoice with the Universal Apostolic Preference of the Society of Jesus for the next ten years, announced by Fr. General Arturo Sosa, specially with the fourth, To collaborate in caring for the Common Home.